Nematodes (12000 species) are among the most ubiquitous of animals and are found wherever there is sufficient moisture. They occur in hot springs and polar ice caps. Although nematodes are not found in the plankton, they abound in marine sand and mud to great depths. One species lives only in vinegar, another is found in beer mats. Numerous species parasitise humans and animals. Most nematodes are elongate and cylindrical, a few gravid females become spherical. The smallest free-living adult is about 250 mm long; most soil, marine and freshwater species are about 1 mm as adults. Parasites tend to be about 2 – 10 mm but many are much longer: Ascaris lumbricoides grow up to 30 cm, Dracunculus medinensis and Dioctophyume renale up to a metre long. The largest known is Placentonema gigantissima, which grows up to 9 metres in the placenta of the sperm whale. While nematodes vary considerably in size, they exhibit conservatism of structure and all adults have a similar basic morphology. Despite this morphological similarity, nematodes exhibit great physiological elasticity, which has allowed them to exploit a vast range of habitats. 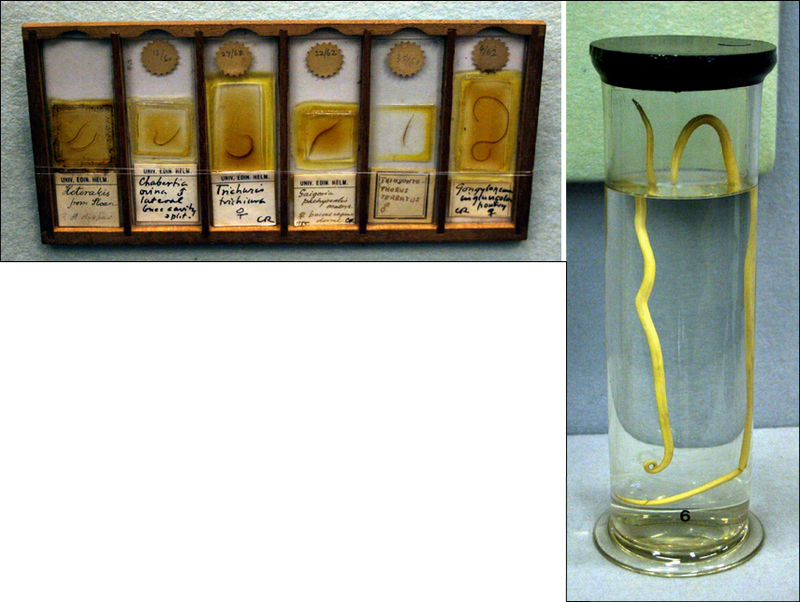 Right: Contortospiculum rheae, an intestinal parasite obtained from a rhea in Edinburgh Zoological Gardens. Below: Microscopic slides with a selection of intestinal nematodes of poultry and sheep, and Ascaris lumbricoides , an intestinal parasite of the pig.